Start with good-quality beef and you’re halfway there. There’s no need to add fillers and binders as you would when making a meatloaf, all you need is salt and pepper. A little fat in the mix means a more tender, juicier burger. Expect them to shrink on the grill, so shape the patties a little larger than the circumference of the buns you plan to use. Char some sturdy fruit like pineapple, mango and even halved peaches or nectarines directly on the grill alongside them. The heat will caramelize the natural sugars and make them extra juicy, perfect for holding a scoop of vanilla ice cream. Shape your ground beef loosely into patties, handling the meat as little as possible. Sprinkle with salt and pepper once formed. Preheat your grill to medium-high. Cook the burgers, without crowding, for 4–5 minutes on the first side, until a deep golden crust develops on the bottom. Flip and cook for another 3–4 minutes, or until cooked to your liking (the recommended internal temperature is 160˚F or 71˚C). 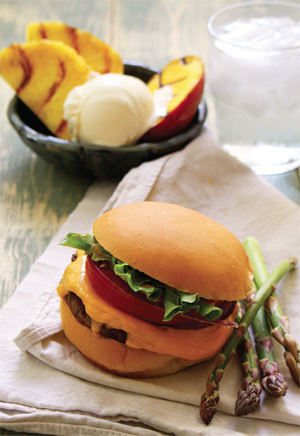 Place the fruit, cut-side down, directly on the grill alongside the burgers and cook until char-marked. Remove from the heat and set aside for dessert. Turn off the heat, add the cheese slices and close the lid of the grill until the cheese melts. Slide the burgers onto buns and serve with your favourite condiments. Serve the grilled fruit for dessert, topped with vanilla ice cream. Serves 4. 545 calories, 20 g fat (10.5 g saturated fat, 8 g monounsaturated fat, 1.6 g polyunsaturated fat), 102 mg cholesterol, 54.4 g carbohydrate, 32.8 g protein, 3.8 g fibre.